Hello. Welcome......I have constructed a forum dedicated to the Neuroscience and Biomechanics related to Human Movement as explored in the Feldenkrais Method. It is not intended to define, describe or explain the Feldenkrais Method, rather it seeks to provide "scientific" information and discussion about/around human movement and some of the basic movement principles utilised in Feldenkrais. This forum seeks to provide and discuss research from the literature that has some relevance and interest to Feldenkrais practitioners and other interested professionals. In the Feldenkrais Method there is an experience and an assumption that the brain/CNS has an image of the body, especially, an image of the weight bearing scaffolding- the skeleton. Secondly, we maintain that this image can be enhanced by sensory input- ie; movement and touch. To begin this online newsletter, I will present what in neuroscience is referred to as "body scheme"- an internal mapping by the CNS of the body. Later we will explore if this body scheme is accessible to modification. Massion J (1992): Movement, posture and equilibrium: interaction and coordination. Progress in Neurobiology 38: 35-56. "Skilful motor performance means producing the optimal response in a context involving external and internal constraints. The external constraints are those imposed by the environmental conditions under which the action is performed such as the gravitational forces, the reaction forces from the supporting surfaces (such as the floor in ATM), imposed accelerations and obstacles. The internal constraints are those which originate in the body itself: the geometrical configuration of the body segments (the 5 lines that Moshe refers to), the internal characteristics of the segments and the internal forces associated with muscles contraction. The central organization of a motor skill takes into account all the external and internal constraints (recall how in ATM we are sensing feeling and playing with these constraints all the time in the quest for simpler easier movement). It requires long term learning as the result of which these constraints are predicted in the central control of the motor act". pg35. Our regular Feldenkrais languaging about movement is recast here in scientific terminology without losing a powerful expression of how movement is organized. Optimal response meaning effortless and simplest. Gravity is a key to movement organization. Constraints, internal and external determine the demands of movement organization. Learning is required to make the movement predictable, ie automatic without requiring reconstruction to perform. Central organization must know something about the geometry and the constraints- hence body scheme. Mittlestaedt (1964, 1983, 1990)- gravity and orientation-don't know this one yet. Clement et al (1984)- flight experiments and erect posture- flight to create micrograivty conditions to study balance. Roll & Roll (1988)- muscle spindle input along the entire kinematic chain from feet to eyes- makes assumptions. Lackner (1988) - tendon vibration experiments - wild stuff. Gurfinkel et al (1988)- head position and neck musculature- great description of the "body scheme". Lacquanti et al (1990)- postural control in the cat- center of mass vs limb geometry- cool research. Copyright © 2000 Robert Burgess. All rights reserved. Standing balance in animals is said to be a function of maintaining the center of mass (COM) or center of gravity (COG) within the base of support. The base of support in humans is a little wider than the area around our feet. Hence, whilst our center of mass (com) falls within the area bounded by our base of support we stay standing, else we fall. The motor control of the center of mass (com) is said to be how the CNS controls balance. COM and base of support. However, it is not the only way that the CNS maintains balance in animals. Lacquaniti F, Taillanter M L, Lopiano L and Maioli C, (1990). The control of limb geometry in cat posture. J Physiol 426 : 177-192. Lacquanti et al (1990) placed a cat on a tilting platform. When they tilted the base, say hind legs up, the cat had to do something to maintain balance. In the first instance the COM was maintained within the area of the base of support. That is, the CNS has an ability to know the vertical (gravity again) and has a knowledge of limb orientation to the vertical- ie "a body scheme." This knowledge is utilized in maintaining balance. Neat stuff. Cool cat. Lacquaniti et al proposed that posture in the cat is maintained by the control of a "preferred silhouette image of the geometrical configuration of the limbs" rather than by the regulation of the projection of the center of gravity onto the support surface. A silhouette- a shadowy image of the basic scaffolding of the body- ie the basic 5 line image again for the skeleton for one contributing mechanism for motor control. This is one form of research into CNS function. From a kinematic study, assumptions / hypotheses are made about what/how the CNS must be performing. Here, because the COM fell outside of the base of support and the legs were maintained vertically, it was then hypothesized that there must be some control for limb orientation in a gravitational field. Maybe true maybe not, but just as Moshe Feldenkrais made a proposal for a motor image or body image from his experience/experimenting, so too do these guys from experimenting with a cat.... Both came to similar conclusions. In Feldenkrais of course we exploit to the fullest (well, maybe not yet!) this CNS geometric configuring of the human skeleton in movement and stance. The touching and moving of the skeleton provides information for the CNS to enhance the motor control of this body scheme. Neat stuff. Cool cat. Maioli C and Poppele R E, (1991). Parallel processing of multisensory information concerning self-motion . Exp Brain Res 87 : 119-125. It seems that there may a independent CNS control for limb length and limb orientation. Placing the cat on a platform and tilting the platform leads to changes of limb length. However, altering the cats visual field leads to changes of limb orientation. A hood painted with a black and white random dot pattern on the inner surface was placed over the cat. The hood was tilted to alter the sense of the vertical. Limb orientation was adjusted but not limb length. These authors concluded that possibly not only are limb length and limb orientation controlled independently but perhaps the sensory input for their representation are also separate. Interesting. Remember there are no neural receptors for measuring limb length or orientation. There must be some way that the CNS transforms all the incoming sensory information to determine these parameters. Lackner J R (1988): Some proprioceptive influences on the perceptual representation of body shape and orientation. Brain 111: 281-297. Mechanical vibration of a tendon at 100Hz induces a contraction of that muscle. The vibration elicits muscle spindle activity causing the contraction. If this contraction is resisted then illusory motion of the stationery limb is experienced. For example- vibration of the biceps tendon causes the biceps to contract and hence the elbow to flex. If this flexion motion is resisted then the arm is experienced as moving into extension. The spindle activity from the resisted motion is interpreted as stretch. In this way spindle activity influences position sense. So vibration causes a contraction of the muscle. Resistance of this contraction is then interpreted as stretch. Even more interesting is to resist the motion by say having the subject hold onto to their nose while the biceps tendon of that arm is vibrated. Blind folded the subject can not see the effects of the vibration and resistance. Under these conditions the subject describes the elbow as moving into extension and their nose becoming longer!! Illusory effective of TVR. Biceps tendon vibration illicits the sense of the arm extending and the nose becoming longer! Under ten test conditions of TVR (biceps, triceps, achilles, rectus femoris in seated and lying positions) all 14 subjects experienced illusory motion of their limbs and body surface distortion. It seems that limb position has representational priority over the body surface configuration. That is, the illusory limb position can affect body contour despite the physical impossibility of the resultant body configuration. Confused. Well it took me some time to work with these concepts. I have reread this article several times. And it gets more complex with later TVR studies..but don't worry- this stuff is not to know but to wonder. "..it is clear that in situations involving contradictory information about limb position and about the surface contour of the body, the surface is perceptually distorted to become compatible with the representation of limb position. This means that physically impossible body configurations and dimensions can be represented perceptually. The bizarre sensations that can result, for example, stretching of the nose, or shrinking of the waist have no discomfort associated with them. The subject does not feel that his nose is being painfully stretched by his hand ... Instead there is a wonder as the dimensions of the body are perceived to change." pg284. So here is evidence of CNS mapping of both surface contour of the body and limb position. Not only that, this mapping is wildly variable and even impossibly bizarre and is highly motile by sensory input. This speaks volumes I believe for our Feldenkrais experience on ourselves and with others. We have all sensed real and unreal images (I am sure) from our bodies and utilized them in ATM and FI. We sense to be true that a CNS mapping or schema of the body is modifiable by sensory input- eg movement and touching. This is a basic premise in Feldenkrais work. We also know that many wild and wonderful expressions of the body image are possible. So the take home message from this long paragraph is the collaborative interaction of multiple sensory input and output . That is, no one receptor or process results in the development of the body scheme and its variability. A complex problem for the neuroscientists to figure out. Just how is this mapping performed and modified. We have many practical skills in exploiting the wonderful motility of the CNS to enhance human function. It is great for me to see parallel experiences in another field of human learning. Take home message: There is a body scheme generated by the CNS, and it is highly variable and modifiable by sensory input be that by TVR or in the case of Feldenkrais experience, by touch and movement. The generation of the body scheme at least includes sensory information from muscle spindles. (C) copyright robert j burgess 2000. all rights reserved. Gurfinkel V S, Levik Y S, Popov K E, Smetanin B N and Shlikov V Y (1988):Body scheme in the control of postural activity. In Gurfinkel VS, Ioffe ME, Massion J, & Roll JP (Ed. ), Stance and Motion: Facts and concepts (pp 185-194). New York: Plenum Press. ".normal functions of the body scheme include: perception of the borders between the body and extra-personal space; knowledge of body dimensions, lengths of the body segments and the sequence of their linkage, their mass-inertia properties; formation of a stationary reference system common for the body and the external space; a proper adjustment of the levels of muscle activity required to maintain a given posture; and postural adaptations to predictable disturbances.."pg191. ". the body scheme should not be a kind of inventory of the body segments but rather a certain scheme that reflects, though in a simplified manner, the basic biomechanical, geometrical and regulatory properties of the organism, i.e. it should be a true model." pg192. Major conclusions are made from these complex experiments (details are more complex than there worth here). I read these conclusions and think of a Feldenkrais ATM or FI lesson. We are always directing peoples attention to limb length, sequence of linkage, etc. I am amazed to find in hard science literature similarities to movement ideas utilized in the Feldenkrais method(R). Eventually, there has to be common ground and language between our practical experiences and laboratory experiments, that is, between movement teachers and researchers. The purpose of this newsletter is to bring the hard science into our world to view similarities and consistencies and sometimes differences. I am amazed at such conclusions being published in the literature. And amazed that they are common to our observations and experiences. Belen'kii et al. (1967) recorded muscle action in the lower leg 50-100 milliseconds prior to activation of shoulder muscles in the action of raising an arm. Hence in answer to the question "what muscles elevate the arm?" we can't forget that in preparation for this action the nervous system takes care of postural equilibrium as well the intended action. This is nothing new to Feldenkrais practitioners. We all the time are aware of movement as an action of the entire musculoskeletal system. By placing EMG electrodes on the calf, front of the shin, hamstrings, quadriceps, spinal and stomach muscles, Belenkiy et al. (1967) found that the very first act in this collection of muscles was a relaxation of the muscles on the front of the shin. These anterior tibialis muscles relax to allow the legs and trunk to lean backwards a little in preparation for the forward reaching arm. An inert structure would fall over if a limb was raised forward in this manner or would strain very hard to produce the movement. Again, even before the shoulder muscles are activated to actually raise the arm, there is a burst of activity in the leg, thigh and trunk muscles. The assumed role of these movements is to minimize the disturbance or perturbation of vertical posture and I would maintain minimize effort and strain. Maintaining equilibrium of stance against (with) gravity is a prime concern of the nervous system. Movements will also occur as a physical result of displacement of one body part affecting another. Figure. Anticipatory postural adjustments for raising an arm. B. Normal. Prior to activation of shoulder muscles, the muscles on the front of the legs relax (straight arrow) and the body leans backwards slightly around the ankles. C. Hypothetical illustration of no anticipatory postural adjustment - an inert body falls forward under the weight of the arm. D. Hypothetical illustration of the body staying rigidly in place. This option would create great strain at the arm-trunk junction: ie at the shoulder joint. These actions of preparation for movement are called: "Anticipatory postural adjustments". Named such because they occur prior to the disturbance of posture and equilibrium from the resulting intended movement. Because they occur prior to action they are called "feed forward" . "Feedback", would mean that they were a response after the action has occurred. In deafferented patients (no sensory or no kinesthetic input), these postural adjustments still occur. That is, it occurs as part of the motor act in a predicted feedforward manner. Bouisset & Zattara (1987) recorded the acceleration forces associated with arm movements and the acceleration forces associated with the anticipatory adjustments. They found that the two occurred in opposite directions and therefore minimizing postural disturbance. Anticipatory adjustments are not fixed but appropriate to the type of movement performed. Massion (1992) and others proposed two separate nervous system controls- one for posture and one for movement. This immediately pricked my attention as contrary to my learning from Feldenkrais who maintained one control for movement. My quandary was somewhat relieved by the earlier writings of Bernstein who preferred a single coordinated nervous control simultaneously of both posture and movement. Moshe lives on, I thought! Another interesting feature of these "Anticipatory postural adjustments" contrary to the experience of Feldenkrais work, is that they appear to have poor transfer of learning from biomechanical experiments conducted so far. Hence when learnt on one side of the body, say as a part of a reaching task, anticipatory postural adjustments did not transfer well to the other side. Ioffe et al (1996) and Jeka & Lackner 1995 observed a transfer concerning the estimation of the target location from arm to the other but no transfer of postural control. This seems strange and I guess there is more to come. Take home message- controlling for posture as related to balance while performing a voluntary act are dual demands combined (probably) into one single act. As Feldenkrais practitioners working on clients with shoulder problems (as an example here) it makes sense to organize the legs and trunk as a part of improving shoulder and arm function. We know this, here is one good reason why. "Anticipatory postural adjustments", once believed to be fixed synergies are now considered flexible and learnt. More good reason and justification for the Feldenkrais Method. Feedforward means that the associated movement is pre-programmed as part of the motor act and is not in response. NB: Whilst all this is familiar to biomechanists, don't expect medical and health professional people to be so up to date. copyright © robert j burgess 1999-2003. all rights reserved. Subject: "The History and Science of Proprioception- The Sixth Sense"
In Feldenkrais the claim is made that it is possible to affect the sixth sense and increase proprioceptive acuity. Regardless of this claim being only an outward mask for the true effects of Feldenkrais it is so common place and accepted and is frequently employed as an introduction to Feldenkrais work it warrants an understanding and knowledge- what exactly is the sixth sense? How was it realized? What are the current concepts? This posting offers some history and definitions for the sixth sense. The earliest references to the sixth sense begins with T. J. Engel (1802) who described a muscular sense but did not know if it was afferent (sensory) or efferent (motor) (Gandevia 1996). Sir Charles Bell (1774-1841) is credited with coining the terms sixth sense (McCloskey 1978) and the muscular sense (Gandevia 1996) in his book (The Hand; Its Mechanism and Vital Endowments, as Evincing Design" (1823). In 1880 the term "kinaesthesia" was proposed by Bastian (1837-1915) to refer to the afferent input to the CNS. A broader term to include vestibular input and sensory and motor inputs not necessarily perceived was proposed in 1906 by Charles Sherrington (1857-1952). Propioception (proprio- one's own, -capio take, understand) differs from the sixth sense and kinaesthesia which are synonymous in referring to perceived sensations of bodily movement and position in that it refers to all sensory input regarding movement including vestibular input. The title "The Brain's Sense of Movement" I think is a very good because it easily and simple defines this function of the brain. The brain's sense of bodily movement whether we know it or not. It exists. The brain needs to have a sense of the body and movement to control movement. This is proprioception. If an individual begins to pay attention to movement and observe the same parameters of movement that brain must be taking into account then this is kinaesthesia and the sixth sense. As stated above proprioception may include some input that is not possible to perceive and hence the subtle distinction between proprioception and kinaesthesia (and the sixth sense). So we can quite happily function without ever paying too much attention to movement. All the while the brain unconsciously is sensing movement. The premise that conscious attention to movement locally and globally can enhance individual perception and control of movement seems logical enough. We already accept this notion for learning motor skills (riding a bike, playing piano, dancing) and for the other senses (taste, hearing, vision). Other terms pertaining to the central control of movement and balance include the "body schema". Head and Holmes (1911) proposed that the brain contains a body schema or an internal model of the body that includes limb length, relationships and positions ie proprioception or sixth sense (Berthoz 2000). Berthoz's (2000) book "The Brain's Sense of Movement" contains a good readable summary of the history and current concepts for the "body schema" pgs 227-232. "the perception of body position and movement and muscular tensions "
"a power of perception seemingly independent of the five senses "
"the unconscious perception of movement and spatial orientation arising from stimuli within the body itself "
Although the sixth sense definition here appears to refer the intuitive sixth sense beyond the five and maybe also muscular sense. Exactly what is it that the brain senses? What is the sixth sense sensing? Gandevia (1996, 2002) and Gurnfinkel et al (1988) have provided working definitions for kinaesthesia and proprioception. These two definitions below are very similar but also differ. All of these motion parameters in Feldenkrais ATM lessons. copyright © robert j burgess 2004. all rights reserved. Eye, head and skeletal muscle spindle feedback in the elaboration of body references, Roll, Vedel & Roll, Progress in Brain Research 1989, 80; 113-123. This study was designed to determine the role of proprioceptive feedback from eye muscles in body and limb orientation during active tasks. The hypothesis was that proprioceptive input from the eye muscles contribute to "whole-body posture" similar to how neck and other postural muscle inputs contribute. Each eye has six muscles: superior rectus, inferior rectus, medial and lateral rectus and inferior and superior oblique. This study was concerned with the first four eye muscles listed above (Figure 1). Figure 1. The muscles of the eye (Adapted from Netter). Experiment 1.1 Mechanical vibration was applied (amplitude 0.1-0.2mm, 70Hz) to four paired positions around each eye of the subject as shown in Figure 2 & 3. Experiment 1.2. Vibration was also applied to the neck (sternocleidomastoid muscle) and ankle (soleus muscle). Under both conditions the subjects stood on a stabilometer with eyes closed and body sway was recorded (stabilometer a device which determines change in pressure of the feet on the support surface i.e. sway/tilt). Experiment 2. The subject was standing in the dark, looking with one eye only through a narrow slot at a small light shining at eye level 57cm away. Vibration was applied to the eyes, neck and ankles. Any body movement was prevented by a restraining device at shoulder level. Postural effects of extraocular muscle vibration. Figure 2. Postural effects of vibration to the superior and inferior recti (Adapted from Roll et al 1989). Figure 3. Postural effects of vibration to the medial and lateral recti (Adapted from Roll et al 1989). Simultaneous vibration of the two superior recti resulted in a forward tilt of the body, while a backward sway occurred with vibration of the inferior recti (Figure 2)(Vibration of the superior recti invokes a sense that the eyes are looking downward and hence the brain makes the appropriate change in posture as if the eyes were looking down i.e. a body weight shift forward). Medial and lateral recti vibration to the right eye resulted in a shift to the right and vice versa for the left eye (Figure 3). In all cases of simultaneous vibration of the soleus and sternocleidomastoid or soleus and the inferior recti or sternocleidomastoid and the inferior recti resulted in increased backward sway. The subjects experienced an illusory shift of the target light with vibration of the extraocular eye muscles. Vibration of the inferior rectus invoked an upward shift of the target and vice versa for the superior rectus (stimulation of the inferior rectus is determined as the eye looking upward, but because the eye does not in fact move at all and the light remains still, the illusion is of the target moving upwards). Vibration to the right medial and left lateral rectus resulted in a shift to the right of the target and the converse was also true. Vibration to the soleus resulted in an upward shift of the target and vibration to the tibialis anterior produced a downward shift. 2. one or several muscles all can invoke the same result i.e. several muscles can be involved at different levels of organization of posture and can contribute to the same synergy. "we suggest that the muscular proprioceptive chain linking eye to foot may be of major importance in inter-relating body space with extrapersonal space". TVR experiments have emerged as a non invasive and querky way of determining the role of proprioception in motor control and the brain's sense of movement. TVR experiments rely on the evidence that muscle spindles are sensitive to vibration. A 80-100 Hz vibration directly over a spindle or indirectly by vibrating the muscle tendon invokes primary muscle spindle activity. Vibration greater than 100m Hz causes the spindle to shut down, vibration less than 80 does not stimulate the spindle and 70Hz vibration appears to be the ideal frequency to vibrate the tendon/spindle. TVR experiments fool the brain. Mmuscle spindles activated by vibration trick the brain which senses that the vibrated muscle has lengthened. If the subject is blind folded or the limb partly out of vision and the body segment involved is restrained, an illusion of movement for that body segment will occur. That is, conscious proprioceptive illusory sensations are evoked (Goodwin et al 1972). These illusions are variable depending on the conditions. If agonist and antagonist muscles (opposing muscles- eg biceps v triceps) are vibrated simultaneously then no illusion occurs but if the frequnecy of vibration differs then movement always occurs in the direction of the higher frequency (Gilhodes et al 1986). (see http://www.efeld.com/fmscience/#TVR ). If the subject has full vision of the process no illusion occurs. The velocity of the perceived movement is proportional to the frequency and amplitude of the vibration on a 1:1 basis (Roll & Vedel 1982). Golgi tendon organs within the tendons of muscles are response to vibrations up to 10 Hz and therefore are not stimulated during 70Hz vibration experiments. A change in position may be sensed without a sense of movement and movement can be perceived without reference to positions within joint space (Sittig et al 1985, 1987). This suggests that limb position and movement are encoded independently. Muscle spindles therefore encode both a change in position and the first derivative of a change in position i.e. velocity (Berthoz 2000). "The movement of the eyes organizes the movement of the body" Feldenkrais 1984 pg 97, seems to be true. That the eyes are involved with movement through proprioception and not just vision I think explains many of the effects of Feldenkrais lessons especially those concerned with eye movements (The classic dead bird lesson). It might be that in movement the body follows the eyes with a proprioceptive lead more so than a visual one though it would be expected that both are integrated. Might it be that when turning and reaching the proprioceptive input from the eyes leads the coordination of body movement while the visual inputs are involved with the target and extrapersonal space (while not excluding visual inputs of the body i.e. the arm). It is exciting to find scientific research that neatly, succinctly and cleverly defines some part of human function especially that which that pertains to experiences in FM (this is an old paper but a classic- more to come). Imagine the effects on a skeletal system of a person who always or mostly looks down or up or to one side. The entire muscular system for flexion, extension or rotation respectively would activated constantly by this bias. Our eyes are proprioceptive and lead movement by vision and feel. 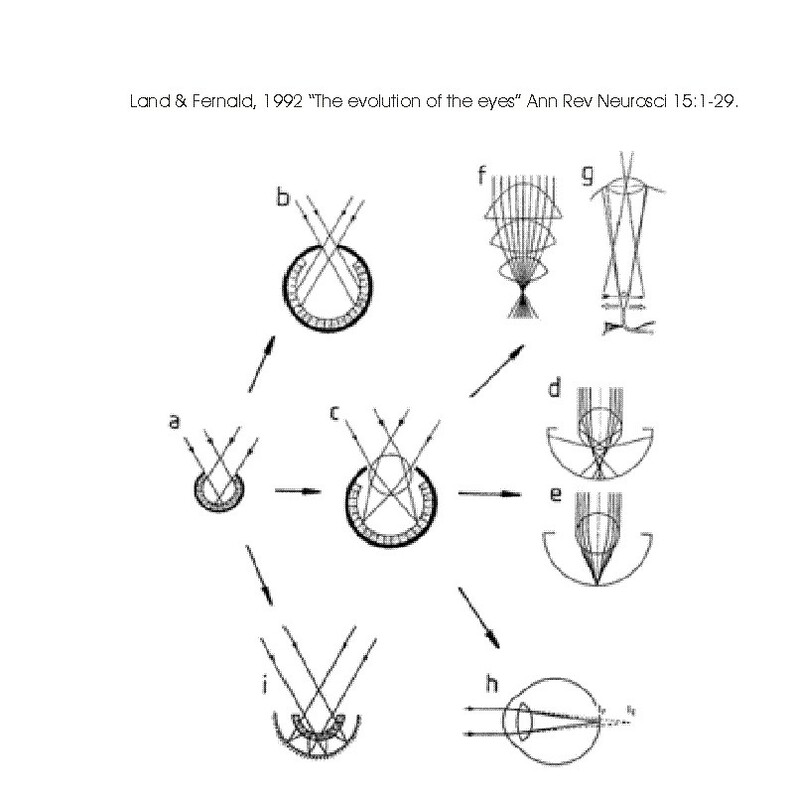 Land & Fernald, 1992 "The evolution of the eyes" Ann Rev Neurosci 15:1-29. I have been fascinated with eye movements in FM from the beginning, however, it took me some time to realize how that relationship worked. When I learnt that eye muscles have muscle spindles like all other skeletal muscles and that they are linked throughout the body, functionally, all the way to the feet (Roll et al 1989- feldiescience 7) then I had a more solid knowledge of how it worked. Then, while reading Berthoz 2000's book, he said, "Without movement there would be no eyes" (in vertebrates and invertebrates). 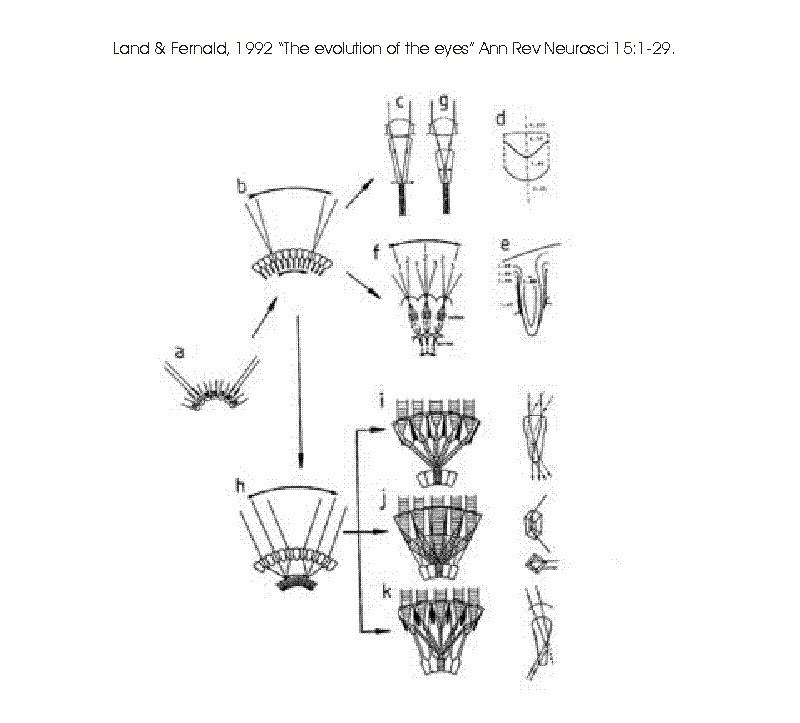 This current paper by Land and Fernald 1992, reviews the complex details of the many eyes of the world of nature. Animals were moving about in the sea long before eyes existed. The first eyes were patches on the skin that could detect light and dark- no image. Hence vertebrate eyes (including humans) evolved from epithelial cells i.e. the skin. The micorvillous of mollusks and arthropods (including insects, crustaceans, arachnids) depolarize to light. Ciliary receptors of vertebrates hyperpolarize light. Either way light is sensed by creating action potentials in neurons. Human and fish eyes are of common descent - can't get away from the fish. 1. a simple eye spot of a small number of receptors in an open cup (Figure 1a). These spots were too poor to detect motion or direct locomotion. Their function was to differentiate light from dark. 2. To detect motion and guide locomotion an eye that could focus light was required. 1. Pit eyes (Figure 1a). Usually 0.1mm in size with 100 receptors. 2. Pinholes (Figure 1b). Mollusk eyes. Poor eye. 3. Spherical eye (Figure 1c-e). Forms a blur on the retina. 4. Multiple lenses (Figure 1f-g). 5. Corneal refraction (Figure 1h). Corneal refraction is limited to terrestrial animals and spiders. Two thirds of human optical power is determined by the cornea. 1. Apposition eyes (Figure 2a-c). Each unit consists of a lens that forms an image. Found in all arthropods and detects movement of predators. 2. Neural superposition eyes (Figure 2f). Dipteran flies. There is a sevenfold increase in the photon signal for these that allows these flies 15 more minutes at dawn and sunset to bother you. 3. Afocal eyes (Figure 2g). Butterfly eyes. 4. Refracting super position eyes (Figure 2i). Nocturnal insects and crustaceans. 5. Reflecting super position eyes (Figure 2j). These eyes contain mirrors that reflect and direct light to the retina. Crayfish and shrimp. 6. Parabolic super position eyes (Figure 2k). Swimming crab. 0-2 dimensional eyes (NB: 3D is done by the brain). 0D: Copepod ( http://www.mov.vic.gov.au/crust/copbiol.html ). Each eye has visual field of only 3degrees. 1D: Sea snails have a linear retina. To see, the eye scans the environment at 90 degrees per second. Animals that inhabit flat open environments have cells arranged horizontally eg cheetahs, kangaroos, rabbit. i.e. horizontal lines of cells across the retina. While tree residing species have a radially symmetric pattern because the lateral view is obscured by trees. i.e. vertical lines of cells across the retina. Movement and sight are linked both in the evolutionary sense (vision developed because of movement) and the functional sense (vision directs movement unconsciously and consciously). This posting is more for interest and information. I am always dazzled by evolution- the variety and processes are so complex and amazing. A word from a short readable book on evolutionary anthropology by Ian Tattersall mentions "expactation". We had a big brain before we used it in its current manner. For example, feathers probably evolved initially as decoration. Then they became a warm covering and then were used for flight. I had a client who one year ago had a severe reaction to cervical manipulation that gave him that gavethe client bad headaches. Things worsened and gradually there was more pain and movement was less and less. Eventually the client was bed ridden and could not move the neck. Then reading became intolreable because it hurt to move the eyes- presumably because this person was down to the last degree of freedom in his system. When I described a progressive loss of "degrees of freedom" because of fear of pain and unknown, it resonated with this client. This person began to come out of this state with psychiatry, new medication and self rehabilitation by walking and then running as comfortable. Now this person presents with severe neck tension with only 45 degrees rotation of head and trunk. The "Sea Squirt" (Urochordata) is an animal that lives on the sea bed and the bottom of boats. The adult form is tube like or sack shaped for filtering water (Figure a). It is non moving or sessile, like rooted to the sea floor. It reproduces by budding. The larval form is a free swimming tadpole like animal with a notochord (precursor to the vertebral column), a dorsal nerve cord and tail musculature that propels the larva (Figure b-c). It also has an eye and statocyst (balance organ). The larval form swims around for 12 hours without food until it eventually attaches to the sea floor (Figure d). Within 30 minutes the notochord, dorsal nerve cord and tail musculature begin to be reabsorbed and the animal returns to its adult sessile form. [Strange as it sounds, the tubular creatures are essentially vertebrates without backbones. They're much more closely related to fish, birds and people than to worms, starfish or other invertebrates. Like humans, they belong to a group of animals called chordates. So the human nervous system began solely as a mechanism for movement. Still today scientists maintain that the primary function of the nervous system is movement. It is possible to imagine a sequence of evolution of the nervous system. One next stage would be the gradual development of aspects of a proprioceptive system to allow the brain a sense of the body in action in an environment. More complexity to motor control and movement and more sensors of the body and environment (vision, auditory sense, vestibular system) hence a larger nervous system. Somewhere along the way the complexity of movement and motor control created a brain sufficiently complex enough for consciousness, self awareness and language. Kaas outlines the evolution of the human brain. I have summarized the article for reading and relevance and I have added tidbits from elsewhere for interest. "Because all our thoughts, actions and feelings are generated by our brains and the very concept of self depends on our brain, it is natural to wonder how our brain works." Equally; "no natural phenomena can be understood without carefully considering how it emerged" Bernstein 1996. This paper relies on three premises discussed elsewhere about the evolution of the human brain (Kaas 2004). Firstly, that early primate brains were small and simple. Second, some mammals living today retain brains very similar to early mammals and therefore can be used to identify primitive traits and distinct from recent trait. Finally, early primates had smaller brains and a smaller somatosensory cortex to body weight than later primates-from prosimiams (lemurs) to monkeys to apes to humans (Figure 1) (Kaas 2004). The human brain has evolved from the much simpler brain of the early vertebrates which first appeared 400 million years ago. The human brain contains its evolutionary history in its anatomy. The fish brain lead to the reptile brain which in turn evolved to the mammalian brain and then to the human brain i.e. the human brain contains the elements of the fish, reptile and mammal. Evolution of nervous systems tends to only add and not subtract. Early mammals appeared 200 million years ago with a thicker modified cortex compared to the reptilian brain. The primary somatosensory area, S1, which receives sensory input from the opposite side of the body, is arranged with the tail and hind limbs on the medial aspect and the trunk forelimbs and face on the lateral aspect. This arrangement of S1 is consistent for all mammals and therefore it is assumed is as is for early mammals (Kaas 2004). Early mammals had no separate motor cortex as is still evident today in the opossums and possums. The motor cortex, M1, appeared 100-135 million years ago. Over 5 million years and especially the last 2 million years, from the apes to man, the human brain increased 3-4 times in size. The larger brain and the specific different organization of the human brain contributed to a difference with other mammalian brains. Placental mammals appeared 135 million years ago with the first corpus callosum. The corpus callosum of 20 million neurons connects the otherwise separate right and left brains (the frontal half of the corpus callosum has been shown to be 20 percent larger in musicians than non-musicians- function affects structure). Early brain structure was dominated by olfactory (smell) processing and a large hippocampus (hippocampus is involved with spatial memory and the environment). Primates evolved 65-90 millions ago with an expanded visual system, a well developed somato-sensory and motor cortex i.e. early primate brains were highly specialized (Remember only primates have a fovea which is more highly developed in man compared to other primates. The fovea is the small central region of the retina that allows for eye focus for fine activities-eg writing, manipulating objects with the hands etc). 30-50 million years ago Apes with no tail, long arms and longer gestation evolved from Old World monkeys. 4-5 million years ago Hominoids evolved from Apes. Early Hominoids walked on two legs but with an ape size brain. As did Australopithecus. 2.5-3 million years ago Homo- genus emerged. The larger human brain compared to smaller brains has lead to more neurons - 100 billion in man compared to only 10 million in mice. The human brain developed more functionally unique areas to help reduce the number of connections and length of neurons (Longer neurons and more connections would take up much space). Another mechanism to reduce connections and taking up of brain space was to concentrate specific functions in one hemisphere (Kaas 2004). The human brain differs from the monkey brain: humans have specialized areas in both hemispheres, in the right hemisphere there are specialized areas for emotions (esp. fear, mournful and pessimism), facial recognition, mathematics, music and spatial reasoning. The left hemisphere is specialized for language. Frontal lobes have a role in the sense of self (the right hemisphere has more white matter and the left more grey). MacLean defined three major regions of the brain according to the evolution of the vertebrates (Figure 2). The Reptilian brain being the most primitive with only the brainstem and cerebellum compared to later animals. Then came the Old-Mammalian brain with the Limbic system and finally the Neo-Mammalian Brain (Humans) with larger advanced cortices. MacLean describes the life of a crocodile as "a lonely and empty life" while he glorifies the cortex of man as "The mother of invention and the father of abstraction ". The synaptic order from sensation to cognition for the older functioning brain i.e. Reptilian and Limbic is less than the more recent cortex Cortex. Hence it takes longer to cognitively evaluate, realize and act than it does to emote and act. For example the route of a reaction for the sighting of a snake is illustrated in Figure 3: Route 1-An emotional stimulus like the sighting of a feared snake arrives at the Amygdala from the eyes via the Thalamus (Not shown). It is then transferred to the Hypothalamus and then to the body- Response = run. Route 2- It is a longer journey to the Visual cortex to recognize the animal then to the Hypothalamus and then to the body- Response = Run or maybe it is a harmless legless lizard. The Amygdala is a source of anger, fear and sadness. It can be readily conditioned but not so readily unconditioned, so much so that Neuroscientist Joseph LeDoux says that "we are all imprisoned by the Amygdala". LeDoux calls the fast acting route of response through the Amygdala- "the quick and dirty route". FM practice: As a profession dealing with affecting people's sense and control of movement and self, some basic knowledge of human nervous system function and evolution is necessary. It is useful to consider this evolution from early primates to man. The comparative study of vertebrate evolution, function and anatomy is revealing and freeing to the individual. To put our nervous system and our self in this context is humbling and revealing. The human brain is evolutionarily old. The emotional brain, the Limbic System, is a faster route to behaviour than via the thinking cortex. The specialization of functions in separate hemispheres will influence right and left asymmetries in client presentation and function can therefore also influence attempts at reorganization. A major feature of FM work is to expose and reorganize the automatic behaviors from the past that are of no use, dangerous or costly to oneself and relations. Bernstein, N. (1996). On Dexterity and its Development . London, Lawrence Erlbaum Associates Inc.
Carter, R. (1998). Mapping the Mind . California, University of California Press. Kaas, J. H. (2004). "Evolution of somatosensory and motor cortex in primates." Anat Rec 281A (1): 1148-56. Kaas, J. H. (2005). "From mice to men: the evolution of the large, complex human brain." J Biosci 30 (2): 155-65. LeDoux, J. (1998). The Emotional Brain: The Mysterious Underpinnings of Emotional Life . MacLean, P. (1990). The Triune Brain in Evolution: Role in Paleocerebral Functions . Tar·sier - Any of several small nocturnal arboreal primates of the genus Tarsius, of the East Indies and the Philippines, having large round eyes, a long tail, and long fingers and toes tipped with soft disc-like pads. Pro·sim·i·an - are the most primitive extant (living) primates = lemurs. Galagos - also bush babies, bush babies or nagapies (meaning "night monkeys" in Afrikaans ), are small, nocturnal primates native to continental Africa , and make up the family Galagonidae. Galagos are agile leapers, and run swiftly along branches. They have large eyes that giving them good night vision, strong hind limbs, acute hearing , and long tails that help them balance. Their diet is a mixture of insects and other small animals, fruit, and tree gums. Bush babies are born with half-closed eyes, unable to move about independently. After a few days, the mother carries the infant in her mouth, and leaves it on convenient branches while feeding. This is a lengthy review article available free on-line at http://brain.oxfordjournals.org/cgi/content/abstract/121/6/1013. I have summarized major parts of it below. The choice of heading included and the numbering system is my categorization of the paper. Italized text in qutations marks is taken directly from the text of the paper. In this article Mesualm argues that the multi-level processing of sensation according to brain structure and function leads to human cognition and consciousness. It is not brain size that differentiates human behaviour from a frog but the synaptic distance from sensation to action. Sensory processing in amphibians, reptiles and birds is "kept on a short leash". From sensation to action is of the order of only one or two synaptic levels. Whilst such a system is quick to respond it is also stereotyped and can lead to destructive behaviour. - rats with crossed sensory nerves in the hind limbs, one of which is inflamed, will hop on three legs to protect the healthy rather than the sore foot." "And an intrinsic bias emerges to pursue novelty and flexibility rather than sameness and stereotypy. The emergence of behavioural flexibility in mammals can be attributed to an expansion of the synaptic bridge that links sensation to action and recognition". Mesulam describes the intermediate levels in the processing of sensation as the source cognition. "The neural systems that bridge the gap between sensation and action provide the substrates for 'intermediary' or 'integrative' processing. The behavioural outcome of intermediary processing is known as 'cognition', and includes the diverse manifestations of memory, emotion, attention, language, thought and consciousness." "The neurons that support intermediary processing are located predominantly within the 'association' and 'limbic' areas of the cerebral cortex". "In addition to retinotopic location, its neurons are sensitive to orientation, movement, binocular disparity, length, spatial frequency, wavelength and luminance". I include this line from the article to show just how complex a task vision is. Retinotopic refers to the fact that the way that light and images form on the retina is matched in the visual cortex. One way to imagine this is to think of the way that large computer cables are constructed. At one end of say 15 sockets is exactly matched at the other end by 15 pins. The wires running from one end the other match the wholes and pins throughout. Similarly, auditory mapping is tonotopic. The figure (Figure 2 in the article) shown of 6 concentric circles illustrates Mesulam's hierarchical arrangement of the 6 levels of synapsing in the brain. Each level of synapsing or "node" "is continually passing on information to the others rather than fulfilling its part of the processing and then transmitting a completed product to the next station". Encoded in the first three synaptic levels are colour, form and motion. To speed up perception neurons at the fourth level are more strongly activated by faces than other objects ('f' in Fig. 2b). Fig. 2 Each concentric ring represents a different synaptic level. Any two consecutive levels are separated by at least one unit of synaptic distance. Level 1 is occupied by the primary sensory cortex. Small empty circles represent macroscopic cortical areas or 'nodes', one to several centimetres in diameter. Nodes at the same synaptic level are reciprocally interconnected by the black arcs of the concentric rings. Coloured lines represent reciprocal monosynaptic connections from one synaptic level to another. (a) Visual pathways as demonstrated by experimental neuroanatomical methods in the macaque brain. (b) The inferred organization of the homologous visual pathways in the human brain. (c) Visual (green) and auditory (blue) pathways in the human brain. (d) Visual (green), auditory (blue) and transmodal (red) pathways in the human brain. In b, c and d, the anatomical details of individual pathways are inferred from experimental work in the monkey. The anatomical identity of many of the nodes is not specified because their exact anatomical location is not critical. This review is guided by the hypothesis that these types of anatomical interconnections and functionally specialized nodes exist in the human brain even though their exact location has not yet been determined. "Transmodal areas" are defined as regions that have no one specific sensory input, they receive multi-sensory inputs from other unimodel regions that are reciprocal (i.e. connection and input to and from a region is returned). Mesulam touches briefly on the Cartesian dualism debate- i.e. Descartes notion of convergence of sensation to the pineal gland. However, the question of "it all coming together" somewhere is carried out Mesulam says in "multiple theaters and where the actor and spectator are one and the same". These transmodal areas include all heteromodal, paralimbic and limbic areas and occupy the fifth and sixth synaptic levels as shown in Fig. 2d. "Mental imagery refers to the activation of sensory representations that are not part of ambient reality. It could be conceptualized as a special type of attentional process targeted to internal representations." It has been shown that mental imagery activates the same neurons and neuronal circuits as when actually performed. Imagining spatial relations i.e. where objects are in space activates the occipito-parietal cortex whilst visualizing objects activates the occipito-temporal cortex. Hence other authors therefore describe two separate visual processing - the "where" and "what". "Virtually any sphere of sensory processing could potentially become the target of mental imagery. Mental rotations and other reconfigurations of visual percepts could subserve nonverbal thinking, whereas the mental activation of auditory word-forms and related associations could support inner speech and verbal thinking." I have always been fascinated in ATM and my own kinesthetic sense that for me it has an indelible connection with a visual image. I don't really differentiate between the two- kinematic and kinesthetic. Another topic for another time. Here Mesulam presses the significance of sameness in perception as leading to stereotyped action- stimulus bound, bound by the stimulus or what Feldenkrais would call it compulsiveness. "The bias for perceiving sameness and emitting automatic responses represents a 'default mode' of brain function and leads to behaviours that can also be designated as instinctual, stereotyped or stimulus-bound. One consequence of this organization is to enhance efficiency and reliability, but another is to promote premature closure, perseveration and response rigidity, phenomena frequently encountered in the behaviours of less evolved species, of infants and of braininjured humans." Mesulam goes on to say that play is an antithesis of sameness. Play is not apparent in amphibians or reptiles (hence MacClean's line: " it is a lonely and empty life to be a reptile" see previous posting) but is present in birds and especially advanced mammals and of course primates. "In humans, sensory deprivation and monotony induce restlessness and even vivid hallucinations." Well we in the Feldenkrais Method have a lot to say about such things. Play as exploration leads to the detection of differences or novelties which is the basis for change and growth. This is basic to our method and later we'll see it basic as Mesulam concludes to the development of human civilization. "Monkeys will work hard in a setting where the only reward is a peek through a window, and human subjects who are given a choice between familiar and simple versus novel and complex patterns, will consistently spend more time viewing the latter. The tendency for seeking novelty may even have survival value: in a prospective study of 2153 community-dwelling elderly subjects, those with a higher baseline level of 'curiosity' had a better chance to be alive and well 5 years later." Curiosity may have killed the cat but it is one thing that keeps us alive and well. Again in reading this article I am struck but how much is similar to Feldenkrais teachings, not as Feldenkrais teachings or -isms but as our biological inheritance. We have evolved to be flexible, curious and novelty seeking in our behaviour. "Emotion, mood and motivation modulate the neural impact of sensory events in a manner that reflects the subjective value of these events to the individual." The amygdala has a role of giving a previously neutral event an emotional charge. Young monkeys don't fear snakes until learned from the mother. The amygdala is the organ that codes emotionally relevant events. Activate the amygdala and you get emotionally charged memories whilst lesions of the amygdala lead to hypo-emotion. "Attention is difficult to define but easy to detect. It usually refers to an enhancement in the selectivity, intensity and duration of neuronal responses to events that have become emotionally and motivationally relevant." "Thus, inferotemporal neurons show attentional enhancement to behaviourally relevant visual patterns, posterior parietal neurons to spatial targets, pyriform neurons to odorants, and Wernicke's area to words." "Attention, emotion and motivation introduce a value system to sensory processing. These value-based modulations allow the CNS to sculpt sensory experience into a subjective landscape." Attention brings along the whole brain, memory, attitudes to the thing being attended to. Hence one reason why in FM we maintain that merely the bringing of attention brings change. So during and after a body scan in a movement lesson we find ourselves already flatter on the floor. The first synaptic level maps sensation retinotopically for vision and tonotopically for audition. The second synaptic level is more complex and involves colour and motion. The third and fourth synaptic levels deal with things like as "faces, objects, words, and extrapersonal targets." "The fifth and sixth synaptic levels contain transmodal gateways.. Transmodal nodes are critical for transforming perception into recognition, words into meaning, scenes and events into experiences, and spatial locations into targets for exploration." "Since the nature, purpose and consequences of environmental events are relatively unpredictable, a new event is likely to activate all networks, at least initially. The steps of perceptual identification, deployment of spatial attention, naming, association with past experiences, assessment of present context, planning of options, inhibition of automatic responses and prediction of consequences proceed simultaneously and interactively. The process can be characterized as a rapid and iterative succession of mental scripts, scenarios and hypotheses that are triggered by interactions between environmental events and internal representations. 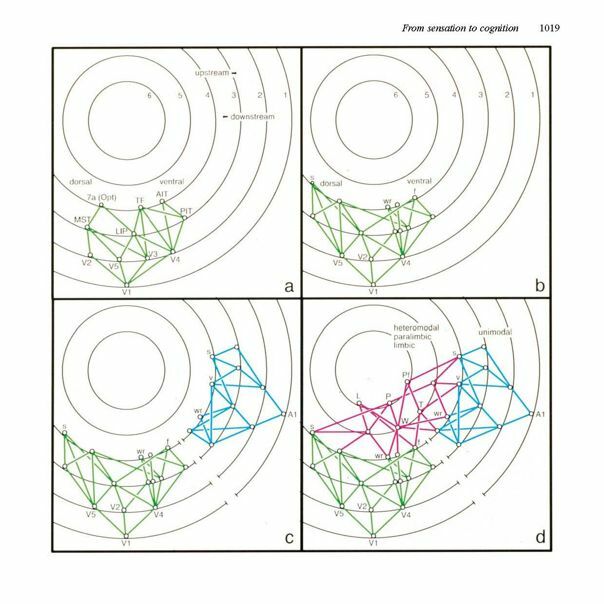 The most relevant ensembles and networks gradually dominate the landscape of neural activity as they become more and more resonant with the goals and constraints of the prevailing context. The solution to the cognitive problem or task is defined as the settling of the entire system into a state of best fit. This is not the final product in a hierarchical assembly line, but a complex surface with many peaks and valleys, spread over much of the cerebral cortex." Hence again novelty brings a difference and an activation of the entire brain. "Mental scripts" is a great description of the active nature of our sense of self and the world. We don't perceive without a history or knowledge and preconceived ways of responding. Inhibition here too a part of growth and learning like in FM. The notion of best fit as the ultimate nature of processing sensation for action is interesting. It is similar to another version of the perception as a scientific process- we gather information, make a hypopthesis and then test it. Where the result is the best explanation for now it is adopted as a truth or theory of the world or self. "From a strictly behavioural point of view, the existence of consciousness might be inferred when a living organism responds to environmental events in an adaptive way that is not entirely automatic. The path from sensation to cognition in the frog is straight and narrow, leading to an equally modest texture of consciousness. In the human brain, the multiple paths inserted between the first and sixth synaptic levels and the addition of working memory . greatly expands the horizon of consciousness by lengthening the temporal influence of internally or externally generated events and by increasing the number of processing channels that can be accommodated simultaneously. The impact of working memory on the quality of consciousness may resemble the impact of resonance, reverberation and dynamic range on the quality of the auditory experience in a concert hall." What is working memory?- multiple streams of information is made accessible in a parallel fashion in the pre-frontal cortex i.e. multimodal rather than unimodal. Mesulam compares working memory to the amount of balls a juggler can keep in the air. So the intermediate processing levels and the multimodal working memory enhances the horizon and quality of consciousness. Again it sounds so familiar to FM work. Our experience with FM provides us with a greater horizon and quality to our consciousness. We need FM to return us to our evolutionary biological capacity. Mesulam argues that the many dimensions of sensation created in the many pathways through the complex network of the intermediate synapses allows for mental relativism. The object in vision does not change when viewed from another angle or another time. This notion Mesulam extends to an act being condoned under one condition but not another. And that individual perspectives may lead to different interpretations and hence then an important feature of relativism is the ability assume another's perspective. Another ability encouraged by Feldenkrais. "A tolerance for multiple alternative representations may provide the critical ingredient that sets the special flavour of human consciousness." (Just for the expression and language of Mesulam- delightful). With the evolution of more complex nervous systems some of its neurons may have been "freed from the household chores of sensation and action" and take on a role "forming alternate and annotated representations" of current events. This is said in another most elegant way by Llinas: "Thinking is the evolutionary internalization of movement." "One consequence of this process could be the emergence of an observing self who becomes differentiated from the sensory flux and who can therefore intentionally comment (introspect) on experience." "Such a capacity for introspection and intentionality may have generated first the sense of a 'commenting self' separate from the experiencing body, then the belief that others also have commenting selves, and, ultimately, that these other commenting selves believe that others also have commenting selves." Here is where Feldenkrais and the FM community will differ with Mesulam. Is the 'commenting self' ever separate from the experiencing body? Can there be a 'commenting self' without a body or its experiences? Then Mesulam reminds us that we evolved from the Apes 5 million years ago and subsequently developed a larger cranium, stood erect and moved the larynx lower for improved vocal output. Over the last 50 to 100 thousand years much of the brain has remained structurally the same but is obviously functionally very different to our cave days. Mesulam argues in part that it is the development of language and civilization that provided communication, recording and passing on of knowledge from one generation to another (we don't have to "re-invent the wheel" so to speak) that has made for changes in brain function. The structure remains the same we now use it differently. "Language ..becomes a consequence of thought, not its cause."). "..adaptability to change, in fact an overwhelming urge to seek novelty and alternative vantage points, is a major characteristic of the human CNS and the principal determinant of the cognitive relativism." There it is again- seeking novelty- differences make a difference. Sameness is dulling to life. I wonder from Mesulam's discussion of not having to re-invent the wheel how much in FM do we actually try to re-invent the wheel? The argument is for self determined learning like how we first stand and as distinct from and perhaps excluding academic learning. Is there a way to speed up our learning in FM from other's experiences. Do we have to re-invent the wheel?. My attention was recently brought to Feldenkrais' comments in his book "The Elusive Obvious" about how much he enjoyed readings from science and how much this affected his work. Is there a place for academic learning and some specific direction and structure in our learning? "The same neural template that enabled the serenity of Ryoanji (see http://en.wikipedia.org/wiki/Ry%C5%8Dan-ji ) has also enabled Auschwitz . It goes without saying that purpose in biology is constrained by survival, not by value. The neural connections that enable the human mind to transcend stimulus-response bonds but do not specify the contents or consequences of the resultant activities". I think Feldenkrais might disagree here. It can be argued from FM work that in fact during the evolution of communities from cave man to skyscraper man that human emotional behaviour also has evolved in such a way as to contribute to the survival and benefit of the community. Is there is a universality across cultures hidden within the self -that just needs to be activated and contrived dangerous behaviour de-activated?. Overall, much is familiar in this article with my experience of FM. Some is different especially thought and sensation as something separate from action. That Feldenkrais' three or four ways to do the same thing is in fact an evolutionary biological feature of the human behaviour is re-assuring to me of the greatness of the work. That adaptability, play and novelty are not only specific to learning in the Feldenkrais Method but are primary agents of the development of human cognitive capabilities. I am always amazed when I read these sorts of science articles that intersect with our FM work that Feldenkrais had put all this together in an even more coherent practical model over 50 years ago. "The resultant texture of human existence, based on the flexibility afforded by the neural pathways that link sensation to cognition, is immensely rich but also potentially quite fragile since not all that is novel is necessarily good. The future of the human race, while almost unlimited in its potential, is therefore also more uncertain than that of the frog". I present these articles not to promote them or demote them rather as explorations, some fact, some conjecture, some in correct in the understanding of human learning, function and behaviour. When writing the letter sequence of 'l' then another 'l' the downward stroke of the first 'l' is different when the first 'l' is instead followed by the letter 'e' or the letter 'n' (Kandel et al 1994). Interestingly, subjects can predict the forthcoming letter long ahead of when it appears. Subjects are able to detect nuances, if you like, in the letter 'l' that change according to whether the next letter will be an 'l' or 'e' or 'n'. Kandel et al (2000) then set out to discover exactly when and by what parameter did this prediction occur. Experiment 1. Method. Twenty seven subjects (aged 23-30) particpated in the experiment. One subject was asked to write letter sequences lf 'll', 'le' and 'ln' ten times using a digital tablet. Three sequences were then chosen for the experiment. These sequences were normalized (by height and width- comes from a previous study - from my rough ll, le, ln you can see obvious geometric differences). Subjects had 10 pretest trials and then were shown segments of a truncated 'l', see below. This was repeated for 320 trials. So the upstroke was shown and then incremental segments or 'gates' of the downward stroke. So at what point of the down stroke did subjects begin to strongly predict the next letter, 'l', 'e' or 'n'? In this first experiment subject's predictions rose sharply beyond G5 and reached predictability at 75% of the downstroke (after G6), i.e. as the line crossed the upstroke. Experiment 2. Method. Nine subjects (20-25 years), same task as above except that 'l' is presented in accordance with time sequences from 50ms to 315ms. After 150ms response certainly increases dramatically and became significant after 200ms. Subjects begin to predict correctly the next letter (see graphs in the pdf). 1. Only part of the down stroke is needed to predicted the next letter. 2. Prediction seems to rely on the acceleration of the downstroke. 3. Prediction also is tied in with maximum velocity of the downstroke. 4. Prediction is higher for the ln versus the 'le' task. The 'ln' task requires a change in rotation of the action, whilst 'le' is a change in height. 5. The critical point where guessing changes to prediction is when the downstroke crosses the upstroke. From other experiments, children under 11 years of age do not predict these changes more than just chance. But at 11 years they become equivalent to adults. An interesting study in itself but it also hints across fields of kinematic nuances. If untrained subjects (10 trails and years of writing) can determine such minor changes in kinematics of hand writing such that they can predict the next letter some time before that letter appears, suggests much about the human ability to detect subtle nuances in the kinematics of human motion. 1. Clearly, differentiation of very fine kinematic variants in motor events is possible even in the untrained. 2. Mere hints from part of an action leads to the possibility of a predictions of what is to follow. 3. If untrained persons (ten trails and and at least eleven years of writing but untrained in the observation and detetcion of such nuances) can predict such subtle variations in a motor event, then likely trained persons may in fact be able to detect and define subtle motor nuance differences not only handwriting but also for say spinal motion, eg say T1-2 versus T2-3 for a given trunk motion or subtle differences bewteen right L4/5 and left L4/5 or even mid foot kinematics of the tarsal bones. 4. Also, very possibly, only small observations of motion, can allow the prediction of a subsequent action, hence a mere instantaneous view of a persons gait may lead to predictability of subsequent actions or predicted motions in another domain eg on the table. 5. Detecting nuances in handwriting requires some experience in handwriting but not in training for detecting nuances. That is, training and learning in an action (in this case handwriting, but it could be gait, golf, tennis, spinal motion) leads to some skill, albiet unknown, in determining subtle differences in action and even prediction of actions from small components of an action. Hence the reason why during a Feldenkrais training the learning of human motion occurs on the body self from personal explorations rather than as traditionally from a medical anatomy textbook. 6. For those working in the movement education field can take heart in that what you think you perceive actually has some creditbility in science. Subtlties in motion are detectable and with observation and learning following events can also be predicted. Prediction is a most powerful act of the human condition. Prediction allows some control or determination over future events. 7. Most interesting was that the effect of spatial information or shape had been diminished by the normalization of the stroke. Hence parameters used to determine differences were velocity and acceleration. Eds C Faure, P Keuss, G Lorette, A Vinter (Paris: Europia) pp 379-388. Developmental Psychology (NB: seems like this paper was never published-probably true information but did not pass journal review). From the School of Public health at Harvard University , researchers followed 670 men over an average of 8 years measuring their pulmonary performance and their level of hostility. Subjects were aged 45 to 86 (mean = 62 years). 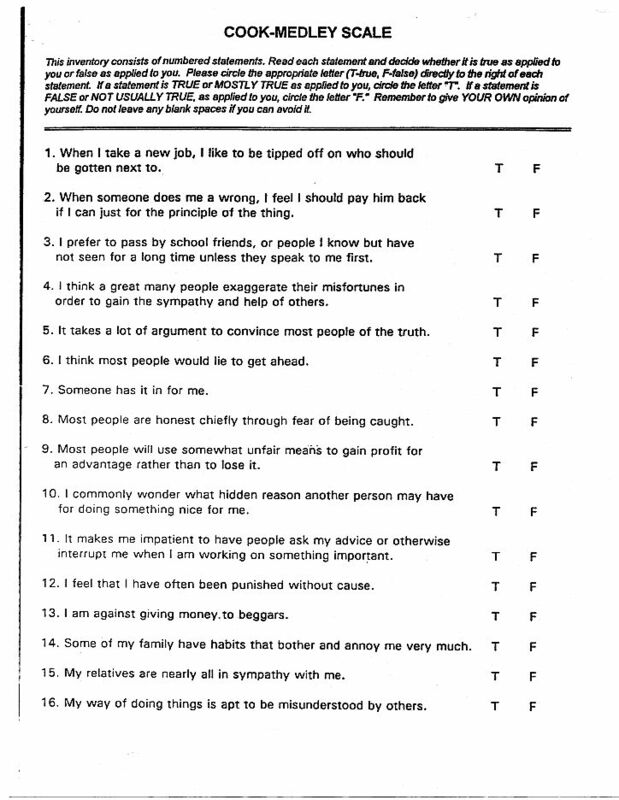 They used the Cook-Medley Hostility Scale to determine the level of hostility in these men. The scale consists of 50 questions (see link below). Pulmonary function was recorded by determining the FEV ( forced expiratory volume = volume of air expired in the first second of a forced expiration) and FVC (forced vital capacity = volume of air expired from a maximum intake breath). Higher hostility was associated with declining pulmonary function. These results were independent of the affects of smoking and education of lung function. When I think of anger I always go to an image of Mr John McEnroe doing one of his uncontrolled outbursts in those difficult moments of international tennis match, although he apparently is still doing it today in any tennis match. Looking at the image of McEnroe some interesting features appear- notice his firmly closed eyes, protruding lower jaw and clenched hands. Also notice his rib cage- it is compressed and flexed especially the lower half. Exploring the action of anger by clenching my hands and locking my jaw open, I instantly also exhale to a fixed point of contraction of my diaphragm and abdominals resulting in a depressed rigid lower thorax. Interesting. Perhaps this action/movement of the rib cage over time may make this region of the thorax rigid and therefore necessarily have decreased expansion of the thorax and decreased lung function at this level. It would make an interesting research to include thorax mobility measruements as well as lung function in hostile men. Cattaneo et al (2009) Representation of goal and movements without overt motor behavior in the human motor cortex. Journal of Neuroscience 2009 Sep 9;29(36):11134-8. The human motor cortex in action observation. The motor cortex (M1) is known its role in voluntary motor action. However, it is also active during imagined movements and when observing others perform action = action observation. Said another way as in this article: "there are two conditions in which the human motor cortex is active in the absence of overt movements: motor imagery and action observation". In this experiment, subjects observed others and actually themselves picked up peanuts using two types of pliers. Thumb muscle and motor cortex activity were measured. The experiments where aimed at determining whether the motor representations recruited for action observation and motor imagery where the same as for preparation for voluntary action. Opponens pollicis muscle is flexor muscle of the thumb used for gripping i.e. it opposes the thumb to the hand and fingers. It is one of the three thenar muscles of the thumb (abductor pollocis brevis, flexor pollocis brevis and opponens pollicis). Normal pliers - every day pliers where gripping the pliers (using oponnens pollicis) closes the pliers. Reverse pliers open by gripping (opponens pollicis) and close by extending the thumb (not opponens) (see figure). Same result of pliers closing but opposite thumb action. Hence the final action of closing is consistent with the intended goal of picking up a peanut but it is achieved by different motor acts. Which does the motor cortex code for: the intended goal (picking up the peanut) or for movements of the body parts to produce the action (flexion versus extension of the thumb and fingers) or for the action of the pliers to complete the intended task (plier closure to grip the peanut)? Muscle activity of the opponens was recorded during the experiment. And motor cortex activity was also recorded. (b) simply manipulating the pliers (opening and closing and no peanuts or goal) = 'no intended goal' . Subjects imagined using the pliers (both normal and reverse in turn) to either pick up a peanut ( 'goal directed action' ) or to just open and close the pliers ( 'no intended goal') . After a training period subjects were asked to observe experimenters using only reverse pliers. 1. For imagined movements for either 'goal directed action' or 'no intended goal' produced the same activation in the motor cortex as for voluntary action. Hence whether the action was goal intended or not the motor cortex was active in the same way as when they actually performed the imagined movements. "The motor cortex excitability in motor imagery does not appear to be influenced by the presence of a goal in the task........motor imagery appears to be essentially a motor preparation i.e., a preparation to act followed by an overt motor behavior". Interesting. So when I mentally rehearse an action motor cortex activity is independent of a goal or no goal. Interesting. Another story. 2. For action observation with 'no intended goal' the cortex activation followed the opponens contraction and thumb action i.e. when the subject observed normal pliers closing there was cortex activity, and when the subject observed reverse pliers opening there was cortex activity. The cortical activity matched that of the action of the hand opening and closing. Remember they only recorded opponens activity- so when the thumb flexed to close the normal pliers there was motor cortex activity and when the thumb flexed to open the reverse pliers there was motor cortex activity in the cortical region of opponens. However, for 'goal directed action' the cortex activity was consistent with the goal and the required movement to acheive that goal (closing of the pliers), but not with the movements of the hand of opening or closing. The cortical region related to opponens fired not with activity of opponens but with closure of the pliers to grasp the peanut using either the reverse or normal pliers. That is, the cortex coded for both the result/goal (picking up the peanut) and the movement (closing of the pliers) used to achieve it but not the movement of the hand required to achieve the task. In observing others, the cortex responds to both the goal and the movement (in this case the pliers but not the hand) needed to achieve it. The brain extends the fingers to the end of the pliers and the action of the pliers to achieve the required task and over rides the muscular contractions involved). "In this way, the observer may generalize with his/her motor cortex the goal of an observed motor act regardless of the type of movement actually used to achieve it". These results for action observation were the same with and without training. When there is a goal of action, the cortex appears to code for the ultimate result of the observed movements over the object (grasping with pliers) regardless of the body part movements needed to achieve it. Umilta et al (2008 and next article for posting) showed neurons in the ventral premotor cortex fired during observation of grasping with reverse and normal pliers independent of finger flexion or finger extension needed to produce the action. In observing others act, our brain codes for the the goal of the action (picking up a peanut) and the movements of that action (closure of pliers). Observation of another using a tool shifts the coding in the motor cortex from hand action to the action of the tool and to the intention of that action. In observing others in action we can determine the movements of that action (pliers closing) and also gain some incite into their intentions (picking up a peanut). This does not happen for non-goal intended movements. It also worthy to note that the brain is not coding for muscular contraction during action but rather for the goal of the action and the movements of that action. It codes for muscular contraction and the effects of that muscular contraction when there is no goal to the action. Here we have evidence for the claim in FM that in observation of others our brains are concerned with actions and the intention of those actions. This occurs whether we want it or not. But obvioulsy, paying attention to and developing a skill with is one of the major features of being an FM practitioner. It is evidence that when we observe others in action our brain is active in those same regions (another topic: mirror neurons). 1. Umilta et al (2008) "When pliers become fingers in the monkey". 2. Aglioti et al (2008) "Action anticipation and motor resonance in elite basketball players". 3. Cattaneo & Rizzolatti 2009 "The mirror neuron system". These postings are some what back to front but I present them as I came across them and in preparation for a longer page on the Mirror System. 15. "Transversus Abdominis Myth I"
Mannion et al 2012 Spine stabilisation exercises in the treatment of chronic low back pain. Eur Spine J. 2012 Jul;21(7):1301-10. Core Stabilization (CS) theory and practice claims, mantra and dogma are gradually being chipped away at by good scientific research. Something I have been waiting for and hoping for many years. CS never made sense to me from the beginning. These researchers studied 37 subjects with chronic low back pain before and after a standard CS treatment program. Subjects were given training in how to contract their transversus abdominis muscle (TA), the famed purported (but erroneous) primary core stabilization muscle of the lumbar spine. The initial training session lasted 15 minutes during which their efforts to voluntarily contract their TA muscle by the hollowing action of the abdomen was observed and measured using ultrasound equipment to determine the thickness of the muscle during the contraction. Previous research has shown that this method most reliably tests the activation of this muscle, i.e. it gets thicker as it contracts. This thickening has been confirmed by EMG studies of TA activation. The subjects attended once a week for nine weeks for physical therapy and were prescribed ten home exercises of ten repetitions, ten times a day for those nine weeks. Subject’s pain and disability level were recorded pre and post treatment using the Roland and Morris Disability Questionnaire (RM). Subjects did improve their ability to voluntarily activate the TA muscle but there was no change in its automatic involuntary activation during an arm raising task. TA thickness pre and post the nine week treatment program showed no relation to the subject’s pain and disability (RM). So, specific TA muscle voluntary training of subjects by experts and nine weeks of practice by participants had no bearing on the subject’s pain and disability nor on the normal unconscious functioning of that muscle. All that changed was that the subjects could more readily voluntarily contract their TA muscle. Nine weeks of once week PT, 10 exercises, ten reps done ten times a day and all I get is an ability to contract a stomach muscle I did not know but my new found ability bares no relation to my abdominal function or my back pain? "Controlling Muscles is Not Motor Control"
It is not even a good party trick! You can’t affect human function by a focus to muscles (now where have I heard that before). You can’t change back pain by a focus to muscles..
TA is not all it is cracked up to be by the CS people. Learning tricks with muscles is all it is, a trick with muscles. It bares no relation to human function. 16. "Transversus Abdominis Myth II"
Morris et al 2012 Corset hypothesis rebutted — Transversus abdominis does not co-contract in unison prior to rapid arm movements. Morris et al set out to determine if the CS claims for transversus abdominis (TA) were true. Is it that TA contracts equally bilaterally as a rigid corset to stiffen the lumbar spine independent of trunk action? Hodges & Richardson (1996) had reported that TA was the first trunk muscle activated when raising an arm and that its contraction was independent of the direction of arm action such that while other trunk muscles acted as part of the action dependent on the direction of motion of the arm and trunk, TA did not. The hypothesis of TA as a stabilization muscle was fueled by this finding that the TA worked separately from other trunk muscles and trunk action to stiffen the spine and that TA contraction was delayed in subjects with low back pain (LBP). It is this work by Hodges and Richardson that has led to the whole world of physical therapy and gyms adopting the tensing of TA prior to any action. Core exercises, core stabilization has become the rage. Science rules, right? But wait; Hodges & Richardson had only recorded data from the left TA, so how could they determine that TA always acted equally on the right and left? Morris et al (2012) had 6 subjects raise their arms in 8 different patterns- asymmetrical (one arm forward one back), left forward, right forward, bilateral and all of these tasks were weighted or unweighted. EMG wires were inserted into the right and left TA muscles. Arm and trunk motion were recorded via the Vicon camera set up for determining kinematics of motion. From these kinematics the joint reaction forces for shoulder and thorax action were determined. All human action includes a preplanned or feedforward action by body parts. Hence in raising an arm in one direction, the trunk will move in the opposite direction (See Anticipatory Postural Adjustments above). Morris et al (2012) set out to determine the amount and direction of torque (joint reaction force) on the thorax by the experimental arm raising protocol. The thorax rotated anticlockwise with left arm raising and clockwise for the right. And the left TA was active with right arm raising and the right TA with the left arm. That is, the contralateral TA acts to oppose the thorax torque induced by arm action. TA did not act equally bilaterally to stiffen the trunk as reported by Hodges and the CS story. Morris et al suggest that TA acts in synergy with the oblique muscles- just another trunk muscle contracting like and along with all other trunk muscles as part of the intended motion (whether as part of the APA or the ongoing action itself). The Multifidus muscle: Previous research by MacDonald et al 2006 had shown that the other deep special muscle the multifidus muscle also did not act tonically to stabilize the lumbar spine, but instead it again contracted as a part of the intended trunk motion in space and time. Here's the thing: if neither multifidus nor TA act tonically to stabilize the lumbar spine (either before or during trunk motion) but rather they join in with all other trunk muscles to produce movement, where is the stabilization? If there are no muscles acting to stabilize the spine and if all muscles contract to produce movement, then there is no stabilization action. Stabilization of the spine does not exist as an action separate from the intended trunk motion. If no muscle acts tonically to hold the spine, then there is no stabilization action of the spine. which gives a clue to next methodology for the understanding and treatment of low back pain. When will these people come to FM? Action anticipation and motor resonance in elite basketball players. Salvatore Aglioti et al 2008. Nat Neurosci. 2008 Sep;11(9):1109-16. Observing another person in action activates the observer’s pre-motor cortex and the parietal lobe as if the observer was performing the same action. That is, an offline re-enactment of the observed action occurs in the brain of the observer. We simulate offline the observed action. Our brain, our pre-motor cortex and parietal lobe are activated as if we were doing the action but no action occurs. The specific neurons of action observation have been dubbed the “mirror neurons”. This is automatic, however, in this study Aglioti et al show that this phenomenon is action specific and that motor skill training increases the accuracy, predictability and kinematic definition of the action observation. Group 1: Ten professional elite Italian basketballers (age 18-29) = 10 elite athletes. Group 2: 5 sports journalists and 5 coaches (age 23-46) = 10 expert watchers (with 17 years experience with basketball- not stated if these subjects were once players- can’t presume but probably so). Group 3: ten students with no basketball experience (age 18-39) = 10 novices/students. All were right handed men except one elite player and one student who were left handed. The professional players played/trained basketball for 7 hours per week. The journalists and coaches observed basketball for 8 per week. One professional basketball player was filmed shooting baskets. 12 movies were recorded with 6 shots going in (IN) and six going out (OUT). Each movie was 1623ms long (ie 1623 milliseconds or 1.6 seconds) and were divided into 10 segments (See figure). The three groups observed the movie clips in segments and were asked to determine whether the shot was going to go IN or OUT or DON’T KNOW. These categories represented the kind of split second choices players faced during a game. Fast predictions had a greater risk of being wrong and slower choices would delay responses. One key frame was at 781ms, the time at which the ball left the hand. This time punctuation is significant because before this time, prediction of IN or OUT relied on action observation of the player, whereas after this time prediction was attained from observation of the trajectory of the ball. DON’T KNOW: Novices had a high percentage of “don’t know” in the first half of the movies while the elite players made IN and OUT predictions during this time. That is, the novices waited to see the trajectory of the ball while the athletes and coaches relied on bodily cues. CORRECT: Elite players were more accurate in predicting the IN shot compared to the expert watchers and novices. In fact, elite players made significantly more correct predictions for the first 7 movie segments compared to the novices and for all segments compared to the watchers. Elite athletes correct 66.7% of the time, Watchers 42.8% and Novices 40.4% . INCORRECT: Expert watchers were significantly more incorrect than elite players with increasingly incorrect choices with more and more segments. No difference between elite and novices. However, with longer movie segments the error rate increased significantly for novices compared to the elite players. The authors state that the longer segments perhaps lead to time to change a choice rather than rely on the first estimate. Elite athletes incorrect 3.8% of the time, Watchers 16.9% and Novices 10.2%. It gets more interesting. For OUT shots, the observed baskeballer’s knee was less flexed during the early stages of the shot, the wrist was less extended prior to the ball leaving the hand and the little finger was less flexed as the ball left the hand. Trans-magnetic stimulation (TMS) recordings showed an increase in motor excitability only for the OUT shots at ball release and only for the experts athletes. This suggests that the expert athletes determined OUT shots from knee, wrist and finger kinematics with the little finger kinematics being the very very final stage where the player still has influence on the trajectory of the ball. Similar studies have been performed with soccer, ice hockey and badminton with similar results. The badminton study emphasized that novices rely on visual regions whereas athletes rely on motor regions. For FM: more ATM’s and more FI’s. The greater your own bodily awareness and skill the more you can differentiation fine features in another’s actions and perhaps determine what that person might benefit from with you. It is not enough just to watch others to become expert in action observation, one has to do the actions and to know them well for accurate observation of another. It has also been shown that this action observation skill and prediction via the mirror neurons is learnt and trained for specific skills and is not expert for every human action. Basketballers predict basketball but not soccer. Expert classical ballet dancers have greater activity in their motor regions when watching ballet compared to when watching capoeira (A Brazlian martial art) (Calvo-Merino et al 2005). And from motor imagery research, “Motor imagery: if you can’t do it, you won’t think it”- Olson & Nyberg 2010 note in a review of motor imagery that imagining actions is specific for and based in previously learned and known actions. (For FM practitioners; where have you heard that before). A simple analogy would be that it is likely better to be a golf coach after years of being a golf pro rather than to learn golf coaching from a book or video. However, watching others (live, book or video) is better than no previous expertise in a task. On another level, as Damasio said, “when we observe others, we not only see but we feel”. The seeing and feeling have motor actions or kinematics at its core. Cavanagh et al 1987. Pressure distribution under symptom-free feet during barefoot standing Foot Ankle. 1987 Apr;7(5):262-76. Abstract: "The plantar pressure distributions for a large heterogeneous sample of feet (N = 107) were collected during barefoot standing using a capacitance mat. From these data, the function of the foot during standing was characterized. Peak pressures under the heel (139 kPa) were, on average, 2.6 times greater than forefoot pressures (53 kPa). Forefoot peak pressures were usually located under the second or third metatarsal heads. No significant relationship was found between body weight and the magnitude of peak pressure. The concepts of a transverse arch at the level of the metatarsal heads and a "tripod" theory of load distribution were not substantiated by this study. Load distribution analysis showed that the heel carried 60%, the midfoot 8%, and the forefoot 28% of the weightbearing load. The toes were only minimally involved in the weightbearing process. Examples of unusual distributions are shown; finally, a checklist is provided to aid the clinician in evaluating plantar pressure findings". Cavanagh’s article is presented with great illustrations of the pressure distribution pattern for standing upright with barefeet. First, Cavanagh et al divided the plantar surface into ten regions – see below Figure 2 (b). This includes a medial and lateral heel and mid foot regions and three metatarsal head and toe regions. Subjects consisted of 107 persons aged 30 (+/- 9.9 years, 60 males, 47 females). Subjects stood on a capacitance mat with either foot randomly chosen. Hence these authors chose to measure a random series of right and left foot pressure measurements. Figure 4 illustrates the raw pressure data (kilo Pascals) and is a useful illustration of the pressure distribution across the plantar surface. When I look at this diagram I see how well pressure is spread across the sole of the foot. Clearly, the heel takes the major individual weight. This is matched by a spread from midfoot to toes with the metatarsals dominating the forward weight of the body. The authors note that their study differed dramatically from Morton’s 1935 observations that equal weight is borne by the heel and metatarsal heads. Figure 5 looking somewhat like a sandal shows the same data as percentages. I am surprised to see the lateral three metatarsal heads take significant weight. Figures 4 and 5 show the tiny amount of weight borne by the medial side of the forefoot. Figure 9 represents variations from the ‘normal’ pattern described above. Hence the subject(s) in 9(a) have the central pressure of the metatarsal head located over the fifth metatarsal. For subject 9(b), the forefoot takes more weight than the heel. Wow, 9(c) has extreme pressures under the first toe. (d) is flat footed, (e) maximum first toe and metatarsal pressure and (f) decreased second metatarsal head pressure. One thing that comes to mind are the sandals and flip flops and the toes indentations that occur after a time in this type of foot wear. Frequently, I have noted strong pressure marks in the toe regions equal to the metatarsal indentations. What is going on? From the work by Cavanagh et al, one would expect very little or no toe indentation but perhaps this type of foot wear demands a gripping by the wearer. Or, perhaps, for those persons with this wear pattern for the toes, do indeed have increased toe effort for some other reason. A habitual clawing action perhaps. One more thing, a place to observe a person's plantar pressure habits is with the bridging action performed in supine with bent legs. As the person raises their hips/pelvis from this stance they may well reveal their weight bearing tendencies. I find many variations frorm the normal decsribed can be viewed from this action. copyright © robert j burgess 2007-2014. all rights reserved. Copyright (C) Robert J. Burgess 1999-2014 All Rights Reserved.